The hawk madness all began with a single goose. 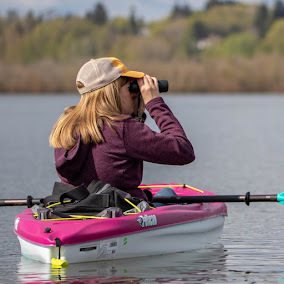 Wednesday evening I received an eBird alert in my email that an Emperor Goose had been photographed on Sauvie Island that morning. My friend Frank had just arrived in town and we made plans to go goosing Thursday morning, arriving fairly early at the spot. A lone dead cackler lay in the field. 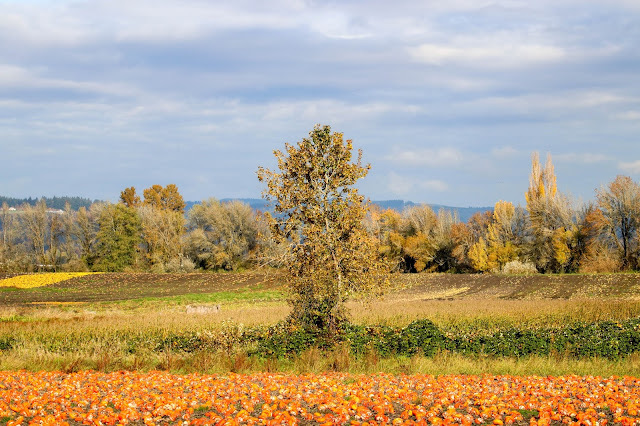 We searched the flock of 15-20,000 Cackling Geese wandering a potato patch near the bridge with no luck, noting only a few Snow Geese and one Greater White-fronted. We were denied the goose but went on to bird several other spots. In the evening I found Beverly Hallberg's post of a potential dark morph Ferruginous Hawk on Sauvie Island, perhaps a bird we had even seen as we drove by on our goose hunt. She posted some interesting photos here. Friday morning Frank and I joined forces with Audrey, powered by sugary donuts, and returned to the island to look for the hawk. We immediately crossed paths with Andy Frank at the goose party for one more Emperor check. No dice. We arrived at the field where Beverly had seen the bird, and later Nick and Peyton had seen it also. 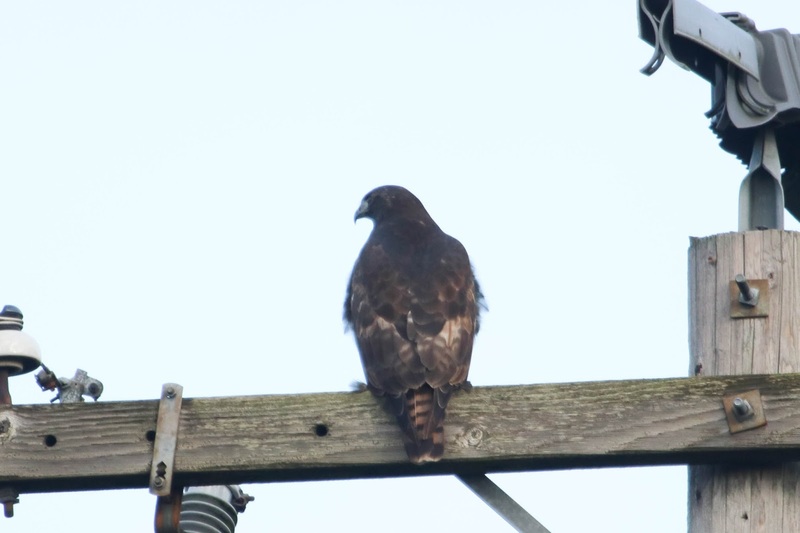 A dark morph hawk was perched on a power pole. 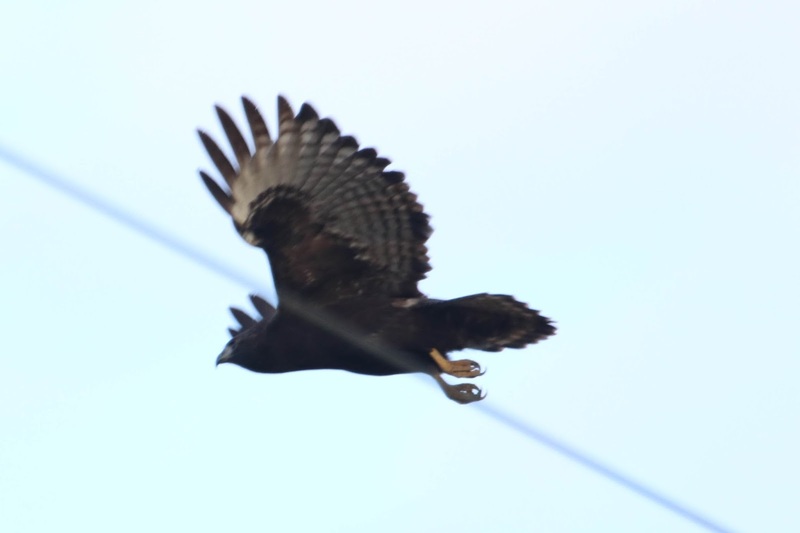 As it flew off we dismissed it as a Red-tailed Hawk, and found no other potential candidates in the area. We drove up Oak Island Road for another vantage point and so we could smell the lovely scent near the "Black Phoebe spot." No phoebe. We drove further to a pull-out and scanned over a pumpkin patch to a tree with a dark morph something inside. Andy Frank caught up with us again and all four of us walked a muddy road to another viewpoint of the tree where we confirmed it was another Red-tailed Hawk. Back on dry pavement, Frank heard the phoebe which flew in and landed on top of the arborvitae-type trees along the road there. 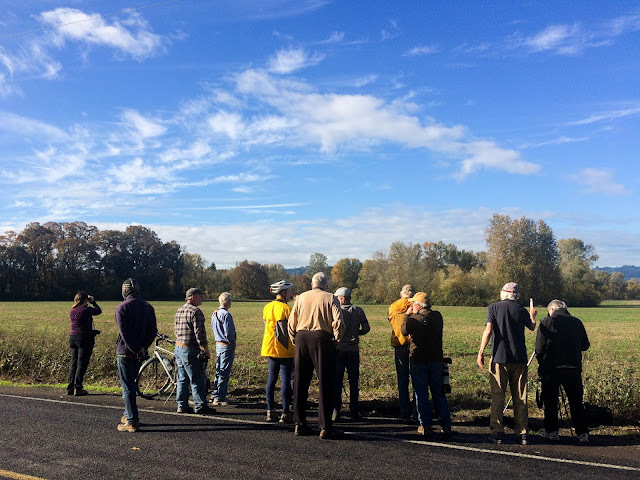 Andy pointed out a flyover Peregrine, and on our way back up towards Reeder Road a flock of 60 white pelicans circled in the distance. Back on Reeder Road a birder circus had assembled. We could see a row of men (all men) lined up with scopes, staring at a dark hawk in a tree. 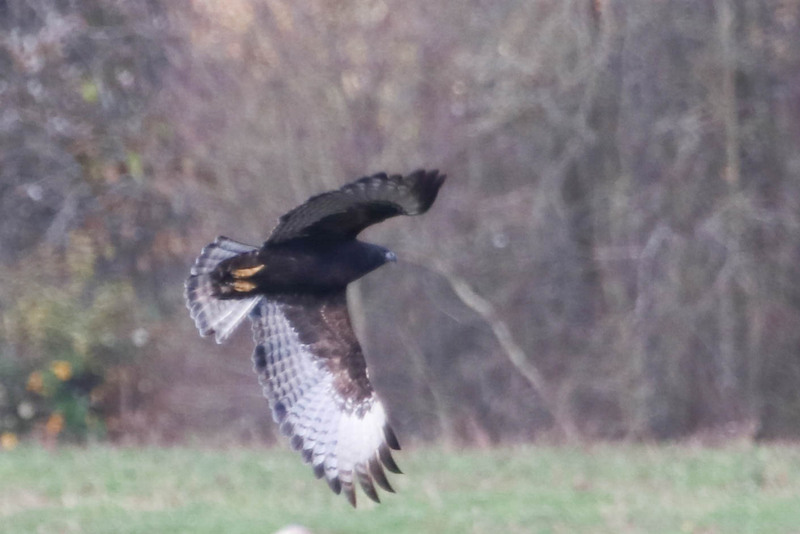 It looked like the hawk we had seen earlier, but we met up with the birders to hear what was going on. There were a lot of familiar faces including Bob Stites, George Neavoll, Tom McNamara, Philip Kline, Ken Chamberlain, Steve Nord, and others I am forgetting. I got the impression that everyone believed this bird to be the Ferruginous Hawk. After watching the bird for a bit, Frank, Audrey, and I walked back up the road for another angle. 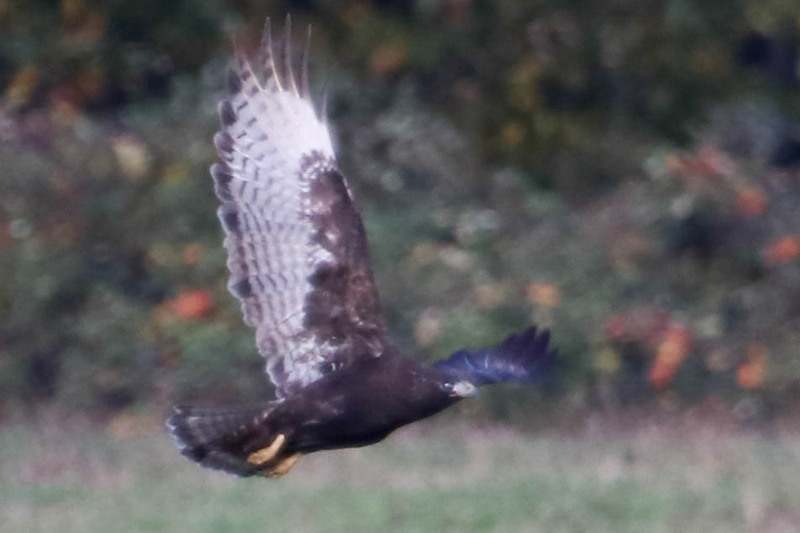 Away from the group we discussed concerns that this was the bird we had seen earlier, that this was not a FEHA. Frank, who knew the most about hawks of the three of us, believed the bird to be a Red-tailed Hawk. The hawk flew closer to the big group and so we returned, bringing our doubts with us. A healthy discussion of the bird's features grew and it was quite interesting to listen in on. Field guides appeared, as did Carole Hallett who is also quite knowledgeable about hawks. Was the gape long enough? Were the tarsi indeed feathered? Was this the same bird Beverly had photographed? 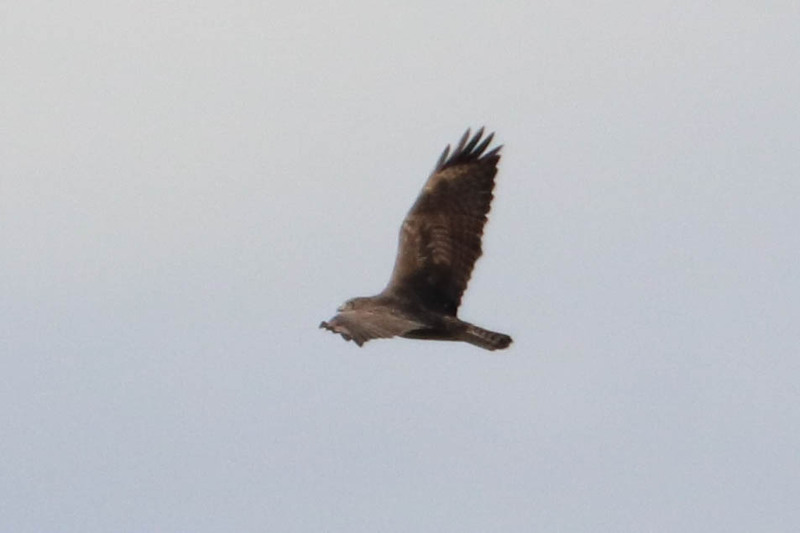 The bird flew again and the shape of the wings seemed to indicate Red-tailed. We left the scene believing the bird to be a RTHA, and most folks seemed to agree. On OBOL yesterday evening several people concluded that this was not a FEHA, and that it was indeed the bird Beverly had photographed. The grass in her photo had prevented the tarsi from being visible. This morning Carole Hallett shared more insight on the age of the bird, and mentioned Bill Clark's identification of this bird as a Harlan's Red-tailed Hawk. Even though no one obtained a county bird yesterday morning, it was still fun to take part in the discussion of an interesting bird. Taking a closer look never hurts! Like you said it is great to have all that input, how frustrated I get birding alone and having no one to say NO it is not! Happy to see your post!! Happy to see that the birder circus included a dude on a bike! That is a cool hawk no matter the identity.